Mole Creek offers a whole range of attractions and activities to enjoy, from wildlife sanctuaries to beautiful walks and lookouts. Take a look at some of our recommendations to make sure your trip to Mole Creek & the local area is one to remember. Discover the imaginative, inspiring one-hectare garden, one of only six Australian gardens featured in the book Gardens of the World. Huge borders filled with unusual perennials, grasses and shrubs. Small orchard of heritage fruit trees, productive potager, trout-filled creek, birch copses, roses, espaliered apples. Magnificent autumn colour mid-April/mid-May. Grass labyrinth, specialist nursery and garden shop/gallery attached. Wheelchair access to most areas, toilet. New owners were adopted by the garden in 2016 and they have re-invigorated the garden’s vitality. A number of ‘garden rooms’ provide space and quiet contemplation. Local primary producing industry employing 10 – 15 local people producing and packing honey of the highest quality, including the uniquely flavoured leatherwood honey which is only produced in Tasmania. The leatherwood tree traces back to the time of Gondwanaland. This pure honey is produced from wilderness areas, many listed as World Heritage Areas, bringing to you one of the finest quality products in the world. An enchanting short walk (about 40 minutes return) takes you to a forest lookout perched high above the Mersey River (shown at the very top right in this picture, viewed from below), as it flows along the valley through the Alum Cliffs Gorge. From the carpark, steps climb to a forest clearing where you will find one of the installations which form the Great Western Tiers Sculpture Trail -Soulevement-Triangulaire, point de vue – by David Jones. This enormous structure acknowledges the triangulation of three major physical references – Quamby Bluff, Alum Cliffs Gorge and Western Bluff, as seen from the site of the sculpture. The all-weather path continues on through forest, along a high, tapering ridge, until you reach the breath-taking lookout platform. Tulampanga, or Alum Cliffs, was a place of particular social and spiritual significance to Aborigines because of the ochre to be found in that area of the Gog Range. Many tribes traveled to Tulampanga to obtain this highly prized material and for them this was a sacred celebration place. The connection of Aboriginal people with the Mole Creek area is thought to date back more than 10,000 years, and the Pallittorre band of the North tribe was based around Mole Creek/Meander. To these early inhabitants, the Great Western Tiers were known as Kooparoona Niara, or Mountains of the Spirits, culturally significant as the meeting place of three Aboriginal nations. How to Get There: Turn right at the end of our driveway – only .8km away! Tasmazia is a wonderful family attraction and features no less than 8 mazes, a whimsical model village built to 1/5th scale, the Honey Boutique, the Pancake Parlour, a gift shop and a lavender farm, all featuring the wonderful backdrop of majestic Mt Roland. Follow the signs from Sheffield – this is a must see. sinkholes in all. Its national park status was declared in 1996 to provide protection for some of the finest and most visited cave systems in the State, including Marakoopa and King Solomons Cave. These deep limestone caves of superb stalactites, stalagmites and columns, glow-worm displays, subterranean streams and cathedral caverns attract many thousands of visitors each year and 2009 marked their 100th year of operation. Both caves are home to a range of fascinating animals which have evolved features which allow them to adapt to their lightless environments. The glow-worm display in Marakoopa Cave is the largest you will see in any public access cave anywhere in Australia. For more information about King Solomons Cave and Marakoopa Cave, see Mole Creek Caves page. Trowunna is a wildlife park with a difference. We started caring for our native animals 30 years ago and continue to house the world’s largest heritage population of endangered Tasmanian Devils. Trowunna has a great range of marsupials, birds and reptiles, even though we do not collect from the wild but rather rescue and rehabilitate wildlife. Trowunna has become such an animal-friendly place that much of the wildlife is drawn to the sanctuary as a natural safe haven. The Devil Education and Research Visitor Centre at Trowunna aims to highlight the unique carnivorous mammals that live in Tasmania, with displays, interactive maps and puzzles for kids. Facilities include a kiosk, gift shop, children’s playground, barbecue and picnic areas. A short alpine walk (about 30 minutes return) to a stunning lookout platform overhanging the sheer cliff face, with views to Mount Ossa, Cradle Mountain and other features across the huge chasm of the Fisher River valley. This is a simply awesome experience on a windy day, when the dolerite cliffs channel south westerly winds up into the gullet. How to Get There: Take the 812 (C38) west from Mole Creek, past Marakoopa and King Solomons Caves, then Mersey Forest Road for a very short distance, turning left at the signposted road to Devil’s Gullet and Lake Mackenzie. There is about 14 km of good gravel road – but it’s worth it! About 35 minutes drive from Mole Creek. From Mole Creek, either via Deloraine or you can wind your way along the base of the Great Western Tiers via Caveside, Western Creek and Meander, or you can pick up the Lake Highway for a sensational scenic drive which winds its way up the face of the Tiers to Tasmania’s central plateau. Once you reach the plateau, which is about 1200 metres above sea level, you will enter the Central Plateau Conservation Area and, as you follow the highway, the landscape will open out before you to wide vistas over Australia’s largest natural freshwater lake – Great Lake – one of a series of huge natural lakes which dot the central plateau. Famed for its recreational fishing (as of course are Tasmania’s many other lakes and rivers), you will come across clusters of fishermen’s shacks along the way, but the area is otherwise largely uninhabited. 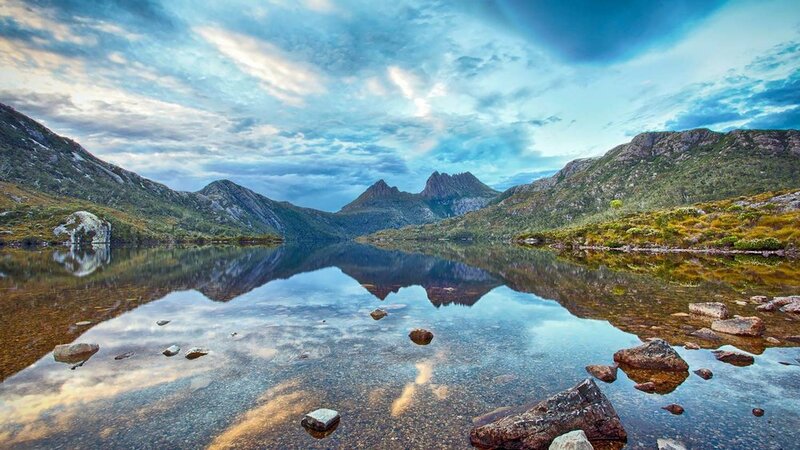 With over 3000 lakes, rivers and streams Tasmania it is an anglers paradise and regarded by many as Australia’s premier wild trout fishing destination. Salmon and trout ova were brought to Tasmania by ship in 1864 and although the salmon failed, but the brown trout thrived in the Tasmanian environment and were later used to stock the waters of other States of Australia and New Zealand. There are many lakes and rivers in the general vicinity offering fine trout fishing. Heading west you will find the Mersey River on your way to Sheffield or Lakes Parangana and Rowallan on the way to Cradle Mountain. Going east you have the choice of the Meander River and Huntsman Lake with Brushy Lagoon and Four Springs Lakes the other side of Westbury. The Tasmanian touring region known as the Great Western Tiers runs from Mole Creek in the west to Prospect, on the outskirts of Launceston, in the east. The Great Western Tiers themselves are a dramatic feature dominating the landscape, comprising the northern escarpment of Tasmania’s central plateau. The most direct route from Launceston to Cradle Mountain takes you through Deloraine and onwards on a magical journey through rolling hillsides of farmland, into a picturesque valley and, in the heart of it all, the tranquil small town of Mole Creek. A round trip taking the 812 west from Mole Creek and turning off onto Union Bridge Road (C137) immediately after crossing Sassafras Creek. This picturesque route will take you across the Don River and up and over the Gog Range, through Paradise and Sheffield to Devonport. Return via Bass Highway and enjoy some fabulous food treats along the way. If you enjoy walking amidst nature’s wonders, Mole Creek is an ideal base. Click the button below for more information about some of the walks and nature trails close by, including Westmorland Falls, Liffey Falls and the Meander Forest Reserve.